One internship position is available to help with sea turtle research on Sanibel and Captiva Islands from May 1 – early August. The interns will be responsible for monitoring the beach overnight in search of nesting sea turtles. Morphometric data will be collected for each turtle and the turtles will be tagged with flipper and PIT tags. Successful candidates must be able to work closely with other interns and a large group of volunteers. 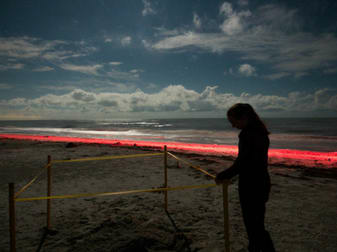 Previous experience conducting nighttime sea turtle nesting surveys and tagging sea turtles preferred but not required. Surveys will start at sunset and will be conducted 7 nights per week. Weekend work may be required. Housing included. Send cover letter, resume, and contact info for 3 references to Kelly Sloan at ksloan@sccf.org. Please write “Nighttime Tagging Internship” in the subject line. We will contact qualified applicants to set up interview appointments. No phone calls, please. SCCF's Native Landscapes & Garden Center seeks an energetic and hardworking intern to assist in day-to-day nursery operations and work with our landscape installation and maintenance services. The Native Landscapes & Garden Center offers a unique working environment, as it is a non-profit retail nursery dedicated to landscaping for the improvement of native habitat and wildlife on and around Sanibel and Captiva Islands.